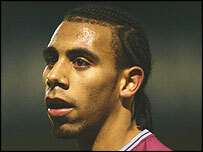 Premiership footballer Anton Ferdinand is to stand trial over an alleged brawl at an east London nightclub. The West Ham player and younger brother of England international Rio Ferdinand was arrested outside Faces in Ilford in October 2006. Mr Ferdinand, 22, denies charges of assault occasioning actual bodily harm and violent disorder. His co-accused Edward Dawkins, 28, of Beckton, east London, who faces similar charges, pleaded not guilty. The pair were granted unconditional bail ahead of the five-day trial on 12 November. The indictment, read out at Snaresbrook Crown Court, identified their alleged victim as Emile Walker. Up to 15 people were allegedly been involved in the disturbance outside the club in Cranbrook Road.